On Thursday, October 30, get zombified by one of our favorite customers and professional makeup artist, Matt Phoenix of Phoenix Burn Productions, then head over to some of our favorite Skippack establishments for drinks and good times! We’ll be going to Hotel Fiesole, Justin’s Carriage House and Basta Pasta in Skippack. All zombies will also get treats from Skippack Sweet Spot 🙂 Pre zombie crawl, we’ll have pizza from Skippack Pizza, and post zombie crawl, we’ll be watching Shaun of the Dead at the shop. 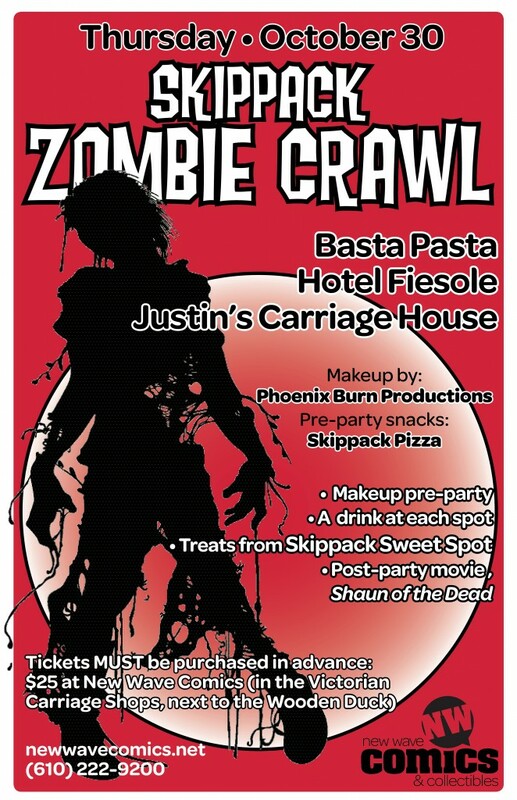 Cost is $25 for zombie makeup, a drink at each of our stops, pizza, candy and the movie showing. Tickets will be available beginning October 15 in the shop and MUST BE PURCHASED IN ADVANCE.